Then I would go on to “God Bless” everybody — Mommy and Daddy, Grandpas and Grandmas, brothers and sister, cousins and friends. My prayers have changed since those days, but sometimes I still feel like I’m saying the same things over and over again. If I’m getting bored with the way I pray, I wonder how God feels. I have a lot to learn here. Prayer is one of those topics that tend to induce guilt (“I know I should pray more.”) or anxiety (“I don’t have to pray out loud, do I?”) or doubt (Does it really make a difference?”). Prayer can seem mysterious, but as Billy Graham once said, “Prayer is simply a conversation between you and God.” And most of us are pretty good at talking. Listening, on the other hand, can be a problem. This fall I’m going to be leading a Bible study on prayer, so expect the topic to come up here in the coming weeks. I don’t expect to have an answer for every question about prayer or attempt to solve this thing once and for all. Instead, my hope is that we will take a step forward in enjoying our relationship with our loving Father, who wants to chat with us awhile every day. This entry was posted in Devo Drops and tagged prayer. Bookmark the permalink. Looking forward to your posts about prayer!! P.S. I think you copied your big sister’s prayers…….those were my prayers, too! And now that same bed-time prayer is also my grandchildrens’ prayer. Our grandsons tend to use the same meal time prayer as our brother — something short and to the point, especially when hungry! Yep. Sometimes dogs or Badger football players found their way into the “God bless” section of the bedtime prayer. 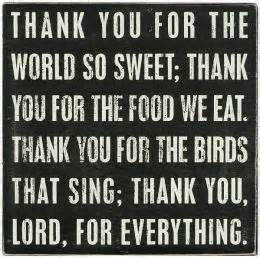 🙂 And, yes, meal prayer is pretty much that one every night…though sometimes I try to jazz it up by singing a version I learned at church camp. They look at me funny…partly because it’s longer, I think!! Funny to read this and realize how much history there is to those prayers we recite so often. I think I switched my mealtime prayer every so often…….got tired of saying the same thing all the time(hmmm…did you write something about that in your post??). I enjoyed changing things up every so often, just to keep everyone on their toes (and not just with new prayers……heehee). I always wondered what “morsels” were when I was a kid! I don’t know my own identity — robmast and Robin are the same person!! Looking forward to future posts….my prayer life could use a tune up. Thanks for reading, Tim. My husband is a UM pastor! Blessings on your series on gratitude! 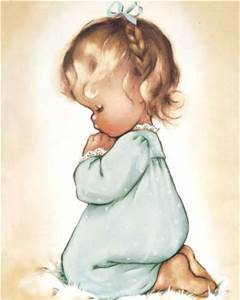 Loved this as it made me remember my mom teaching me to pray Now I lay me down to sleep I pray the Lord my soul to keep. If I should die before I wake, I pray the Lord my soul to take. Although she was not a true believer she did plant a seed in the heart of her child by acknowledging there was indeed a God. The big change in my heart occurred when I learned the name of the only God was Jesus and He loves me and has me forever in His hands whether awake or asleep! I never had to ask Him to keep my soul if I die in my sleep!! My prayers now consist of conversing with Him daily whether praising, confessing, requesting ………and He never judges the quality of my prayers but the Holy Spirit makes my heart ache and feel empty when I put Him aside in busyness and forget to pray or to include Him in my day. He lifts me up!! !